After 122 years in business, popular Connecticut hot dog manufacturer Grote & Weigel will soon close their doors. While the closing will not impact Yank's Franks (Yank's has always used Hummel Bros. hot dogs) it is very sad to see this long time business succumb to our terrible economy. One of the Hot Dog Joints that will feel the impact is Doogie's Hot Dogs. Grote & Weigel supplies (supplied) all Doogie's hot dogs, but the one product that will be most difficult to replace is Doogie's Two-Foot Hot Dog. Yes, that's right, 2 feet of encased deliciousness. For a photo of this delicious piece of hot dog history click here. Doogie's is interviewing other hot dog manufacturers to see if they can talk them into supplying two-footers. To be honest, I think they will find a replacement, but my question is, where do you get a two foot hot dog bun? Neither Hot Diggity nor I have ever been to Doogie's, but I can assure you that if we are able to make it there before they run out of two-footers, that's what I'll be ordering. Frankly, I want a hot dog for breakfast! I had been looking forward to this day for a couple of years now. 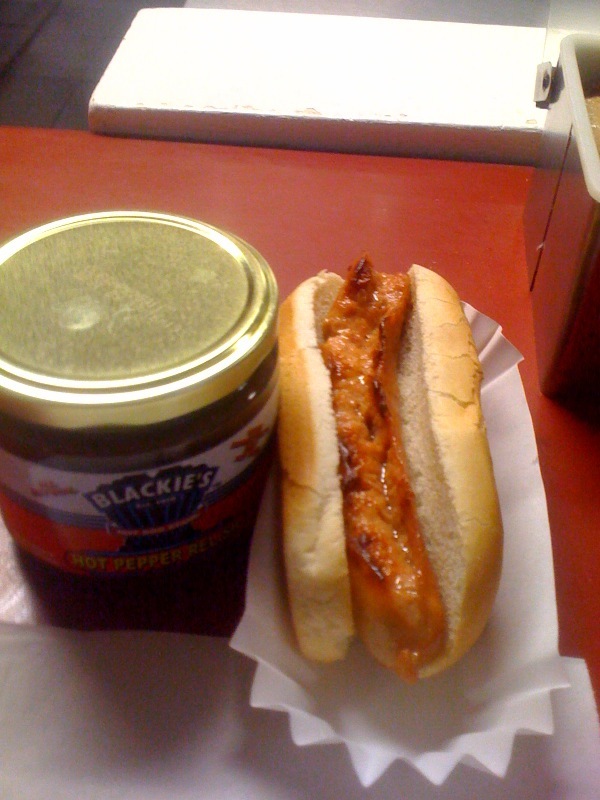 I'd done my research so I knew that Blackie's Hot Dog Stand served Hummel Bros. hot dogs (my favorite) and they had their own, secret recipe, Hot Pepper Relish. Our cross-country drive to Texas started with a Hummel dog at Duchess, and would end with a Hummel dog at Blackie's. Lucky for me, our events in between these outstanding gastronomical bookends were even better. 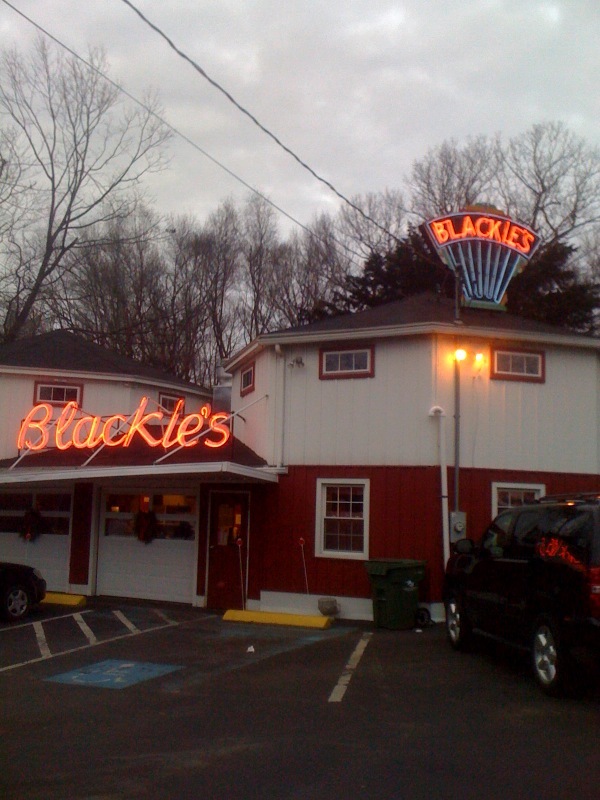 It was just about dinner time when we pulled into Blackie's parking lot. We were greeted with a friendly hello and when it quickly became evident that we were new customers, the young man behind the counter offered his help. The hot dog options are somewhat limited so our decisions were made quickly. Your hot dog is scored and heated in oil and placed on a traditional roll. If you choose your dog well done, it is put on the griddle for a little bit of a char. The toppings consist of spicy mustard and Blackie's hot pepper relish. There is a jug of ketchup on the counter, but I prefer to think it's only there for the burgers. It was one dog for Hot Diggity and two dogs for me. Hot Diggity had hers plain and I chose both toppings on one and mustard only on the other. I immediately realized that I had made a mistake and ordered another dog This one I tried well done. The hot dogs at Blackie's are absolutely delicious. If you are ever traveling through Connecticut on I-84 (west of Hartford) look them up and plug them into the GPS. They are just minutes off of the interstate and they are well worth the stop. Frankly, Yank loves Hummel Bros. hot dogs!